I can't decide on a good choice for the border on this. That first picture is wrong...it now has green all around. I vote #4. The narrow black with solid border. Either of the two shown in the bottom picture would look great. I have a slight preference for the black with the multicolor dots, but the other one carries out the cat theme, so I'm on the fence about it. Don't really care for the narrow black plus bright - not sure why. Does definitely look better with a border. I vote for black with solid. I love your quilt too. I vote for the border with the I Love My Cat theme on it. That is such a cute quilt. Love those cats! I followed a picture I found online a couple years ago....no pattern found...I would have bought it! Not terribly hard...took me a while to determine sizes. Me too !! It seems to make it pop and ties it all together. 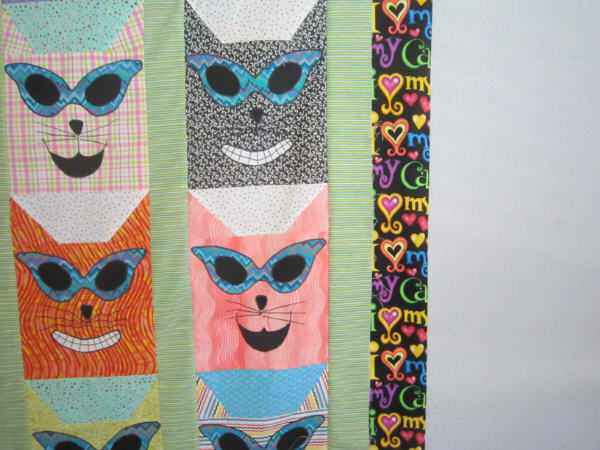 I like the I love my cat fabric border!! So cute!! I noticed all the sunglasses are the same blue fabric. If you have more of that it would pull the whole quilt together. 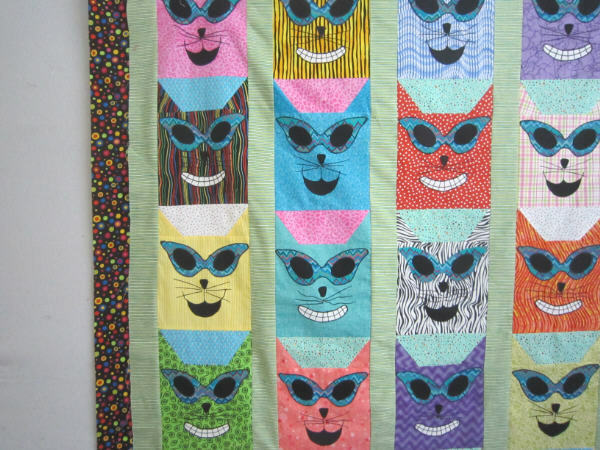 A narrow black w/ the sunglasses fabric IMHO would look really "cool cat"
BTW, I love the quilt!!!! EDIT: If you don't have that blue then the pink border would be my next choice. It doesn't detract from the cool cats! Have you already sewn the green on? If not, I wouldn't use it at all. I like the "I love my cat" border, but I think you need something else to as well. Sorry, not much help, but I do love your quilt. Sew cute!! I'm surprising myself and saying the black with dots. I'm not usually a dot person. Second choice, I Love My Cat. I would go with I Love My Cat. The quilt is so fun and deserves a special border. Hope you post a picture when you are finished so we can see what you decided on. 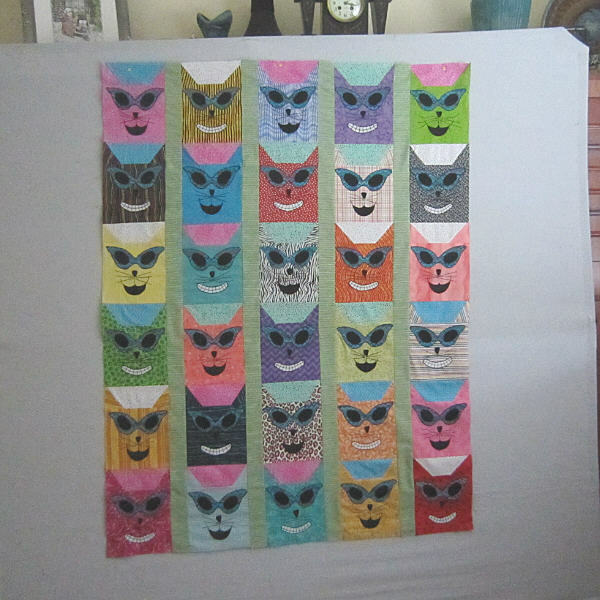 I would put green as the 1st border since it is carring out the sashing, thin 1" "stop border of black and then either the I love cats or the polk-a-dot. If you do the "I love Cats" as the backing then you could bring it around to do the binding. or you could but black as the binding. 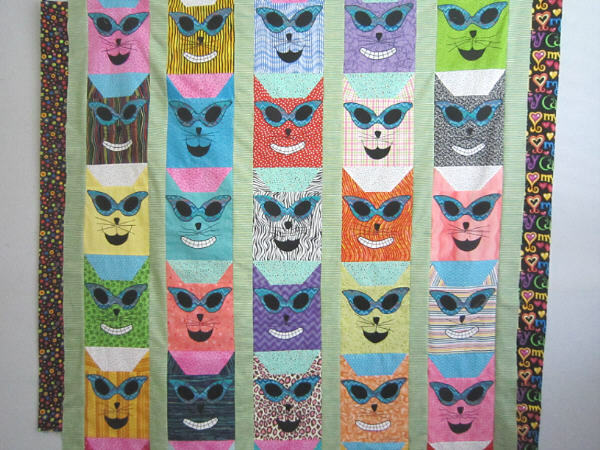 I like the I LOVE MY CATS fabric.......you could always pull out one of the colors in it as a solid to break it from the green border. Good luck deciding. Narrow black with a blue color like the sunglasses,the other dark borders distract your cool cats.......Use back only. 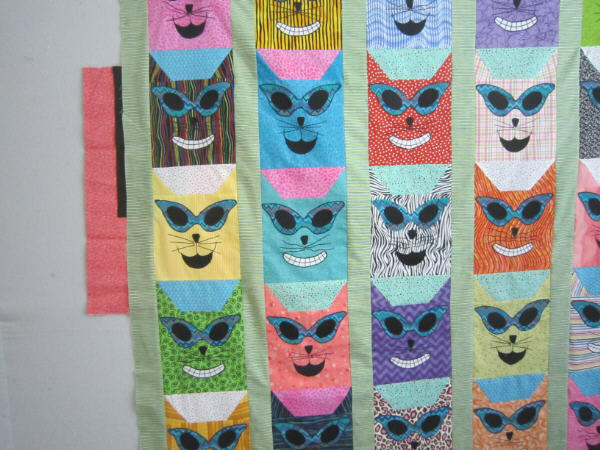 I would choose a colour from the quilt itself, preferably the blue of the sun glasses. I like the "I love my cat" fabric. Makes it pop!